Ferro-axinite’s energy starts at the Root Chakra, and moves upwards, fanning out as it goes. It opens the Crown and Third Eye Chakras, and also the Bindu Visarga, facilitating psychic abilities, spirituality and communication with our Guides. There is also a sense of veiling, allowing one to work openly while at the same time feeling protected. On a deeper level, it can be a powerful aid to inter-dimensional and astral travel, and used directionally, can even cut doors or windows into other dimensions. On a physical level, ferro-axinite can gently aid healing of bone tissue. Axinite is a group of minerals in which iron (ferro-axinite or axinite Fe) may be substituted by magnesium (magnesio-axinite), or manganese (mangano- or mangan-axinite, or axinite Mg). 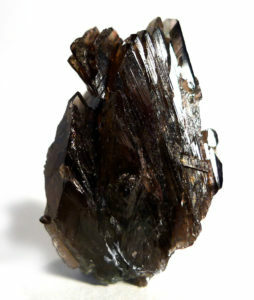 A fourth mineral, tinzenite, contains both iron and manganese. Colour can be brown, clove-brown, plum blue, pearl grey, pink; colour is not reliable for identification, as all varieties may display any of the colours. It is most commonly found in low temperature and contact metamorphic rocks, and also in mafic igneous rocks. Axinite is both pyro- and piezo-electric.